Michele is a recent New York expat who has moved to Las Vegas and fallen in love with the Vegas tech scene. 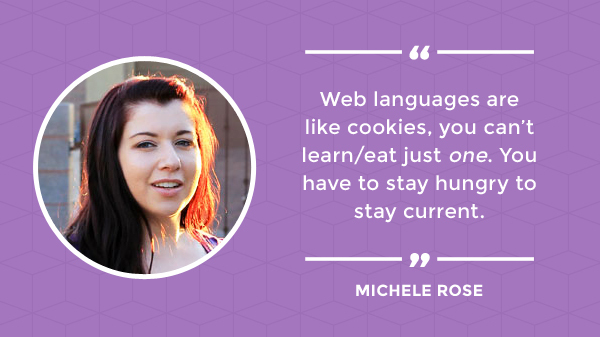 Michele has worked everywhere from Marvel Entertainment to American Express as a web designer and developer. She has an eye for detail and a strong love of pop culture, alluring design, and all things web. We sat down with Michele and got the 411 on her big move, tech experience and the Vegas Tech Scene. When did you start coding? I’ve always dabbled in web development, mainly frontend, since 2005, but I didn’t really get serious about it until 2007. That year, my junior year in college, I was introduced to a professor who started what he called Web Design Bootcamp. It was myself and 5 other students studying under him, 9 to 5, 6 days a week. Three months had passed, and I got my first job, a part time minimum wage job working for the same professor. He supplied us with a year’s worth of hosting out of his own pocket, domains to build our portfolios and brought us clients and work under the company name Subsidiary Design. My senior year, I was working part time, interning at Spike (formerly Spike TV) and going to school. I graduated in May of 2008 and landed the Marvel gig in June. Tell us about the tech scene in Las Vegas? What’s happening over there? Las Vegas is slowly, organically becoming something more than the party town the media has forever portrayed it to be. This year, Vegas Tech celebrated it’s 2nd anniversary and it’s on its way to becoming the next Silicon Valley. In fact, we call it the Silicon Strip. The Vegas tech scene caught my eye long before I moved here from New York. I spent 3 months researching the who’s who of Vegas tech and used Twitter and the hashtag #vegastech to connect with people. I was just looking for a job before I got here but what I found was so much more–a community, strong and progressive with a hunger for growth, learning and opportunity. A week after I got here, I went to a WordPress meetup, a Ruby meetup, then the brand new NodeJS meetup. There’s never a dull moment in the Downtown community! And it’s always buzzing with chatter of the next best thing. Developers, designers and entrepreneurs gather every Thursday at the Usr/lib library above The Beat coffee shop to talk shop, share ideas or hack away at their latest project. It’s a community that’s become a big part of my life. The Las Vegas community is small in numbers, but huge in heart and spirit. Tell us about Startup weekend. Why do you love it? Designers, developers and entrepreneurs gather at a venue, pitch their ideas, build relationships and hack away all weekend to make it happen. I got involved with Startup Weekend when I volunteered to help during the last event in January. I handled social media during the planning phases and throughout the event as well as designed the t-shirts, posters and stickers. Once it was over, I felt that post-partum depression that women say they feel after they give birth. The fun is over, back to reality! It’s hard to come down from that high that Startup Weekend provides as there’s just so much positive energy in the room. So I immediately grabbed all of the organizers from the previous event and started planning the next event. The 5th Startup Weekend Las Vegas happened on May 3rd to the 5th at the InNEVation Center, a co-working space brought to the community by Rob Roy, the founder of Switch, which is a technology ecosystem offering data storage and high-speed Internet access. First of course is my mom. She raised me by herself and I hope to be as strong as she is one day. Second, would have to be Dale Partridge, CEO and Co-Founder of Sevenly.org, a California-based company that sells amazing tshirts and other apparel for great causes. Seven dollars of every tshirt sale goes to the charity of the week and the screen-printed shirts are only available for seven days, hence Sevenly. Third, would be Vanessa Hidary, Def Jam Poet, who mainly writes and speaks about being a Jewish girl from Brooklyn, somehow that speaks to me. Being myself a Jewish girl from Brooklyn, I can’t imagine why I identify with her. I recently devoured her book and then licked all my fingers after I was done. It was that good! If you had all of the time in the world, what would you want to learn? First, I’d start with learning every web language: Ruby, advanced PHP and Python. I’d then move on to native OS and Android app building. 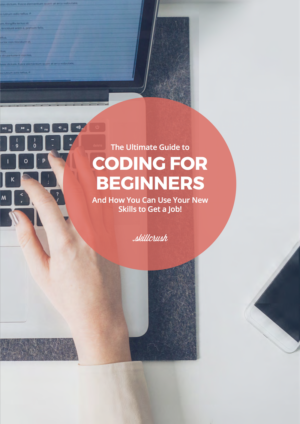 What advice do you have for people just starting to learn to code HTML & CSS? My advice for those starting out is to pace yourself, don’t give up and have patience with yourself. Find what works for you in terms of what applications you use, coding styles, etc. Of course, stick to web standard methods but don’t be afraid to adopt your own personal style. Also, web languages are like cookies, you can’t learn/eat just one. You have to stay code hungry to stay current. Prev: Create Your Own Hack Day With Our Free Resources Next: Got a project you want to build, but no clue how to build it? Need to get stuff done? Try these awesome productivity apps!